Alangaru, Mar 14, 2017: It is reported that ’Rubber and Cashew plantation’ on five acre land has been destroyed due to short circuit on at Kuntyana in Peraje village of Alangaru. Around 350 rubber trees worth Rs 2 lakh owned by Kushalappa Gowda have been destroyed in the accident. Also, Rs 2 lakh worth 200 rubber trees and 150 cashew trees owned by Chennappa Gowda were also destroyed in the fire accident. 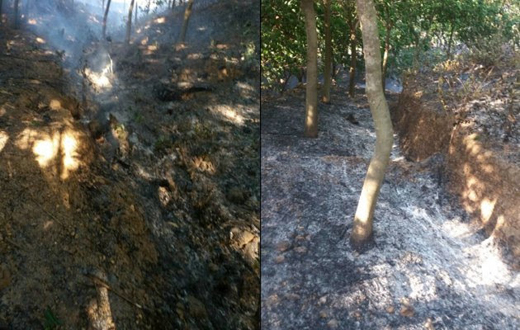 The rubber plantation was burnt in a fire accident following short circuit last year. Chennappa Gowda has alleged that the irresponsibility of the Mangalore Electricity Supply Company Limited (MESCOM) officials has resulted in short circuit to burn his rubber plantation this year also. The rubber plantations have been destroyed completely . This is may be called a the Carelessness of the owner of the land lord, because when last time the incident of the same has occurred why not complained to electricity board ? So many plantations are lost due to fire. This may the work of some miscreants as the fire spreads all over. The loss will be covered by fire insurance but can they be able to get the same back . Lost is lost.